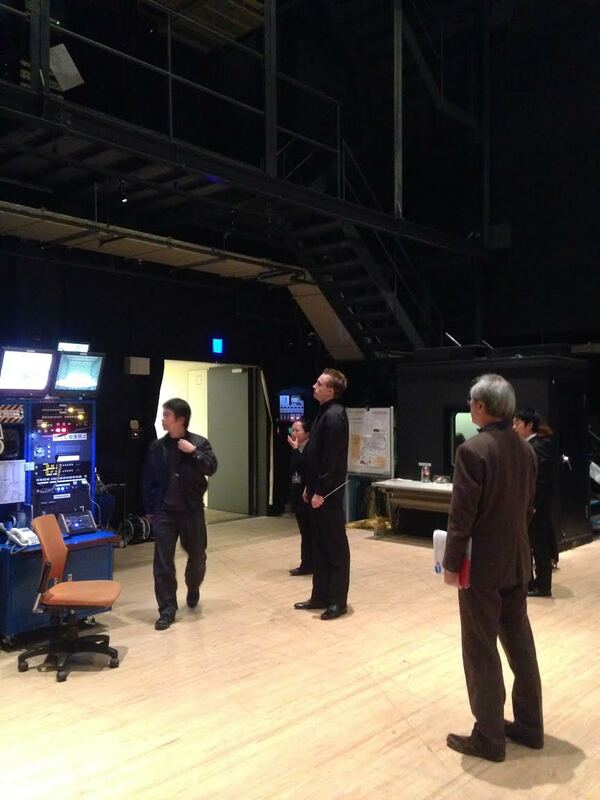 The concert in Osaka was another afternoon performance, beginning at 2pm. 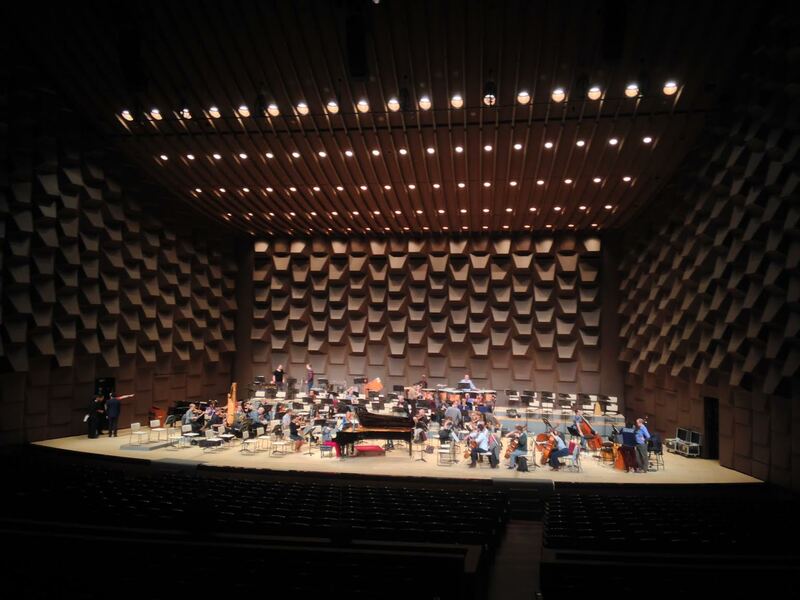 As we were already staying in Osaka, at the Rhiga Royal Hotel, the only travel would be a ten minute coach journey to the venue, the Osaka Festival Hall. 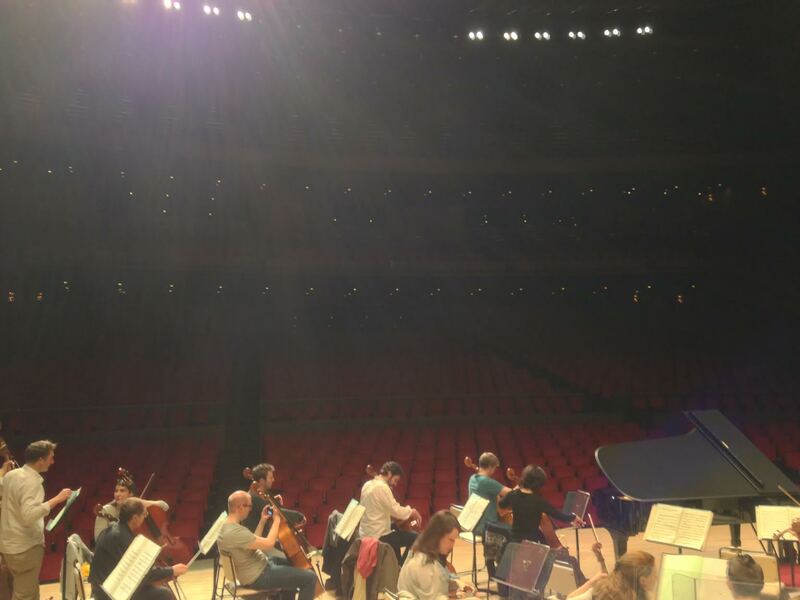 As the repertoire was already well honed, Vasily Petrenko only called a one hour rehearsal; mainly to get the orchestra used to the acoustics and also to give Nobuyuki Tsujii a good ‘tickle on the ivories’. The programme on offer for our fourth concert was our Stravinsky and Prokofiev concert. 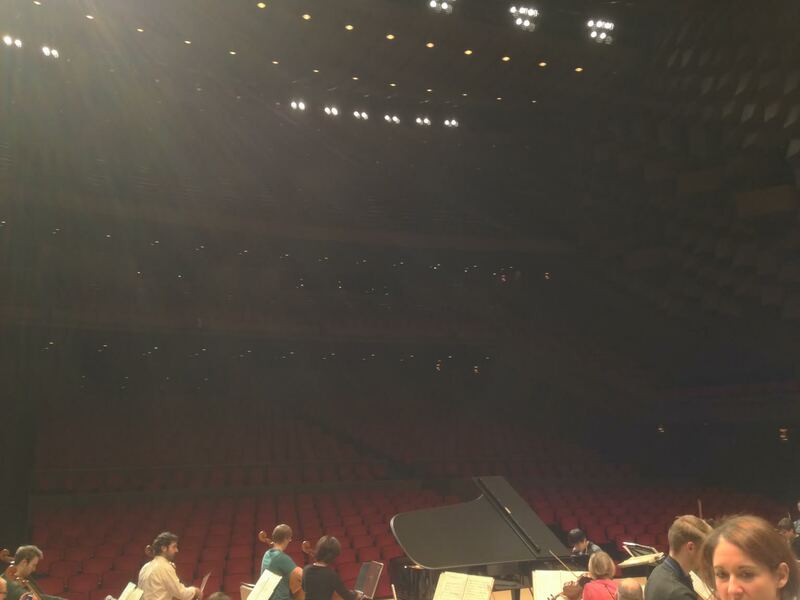 The Osaka Festival Hall is one of the best concert halls I have ever been in. It is conceived on such a grand scale! 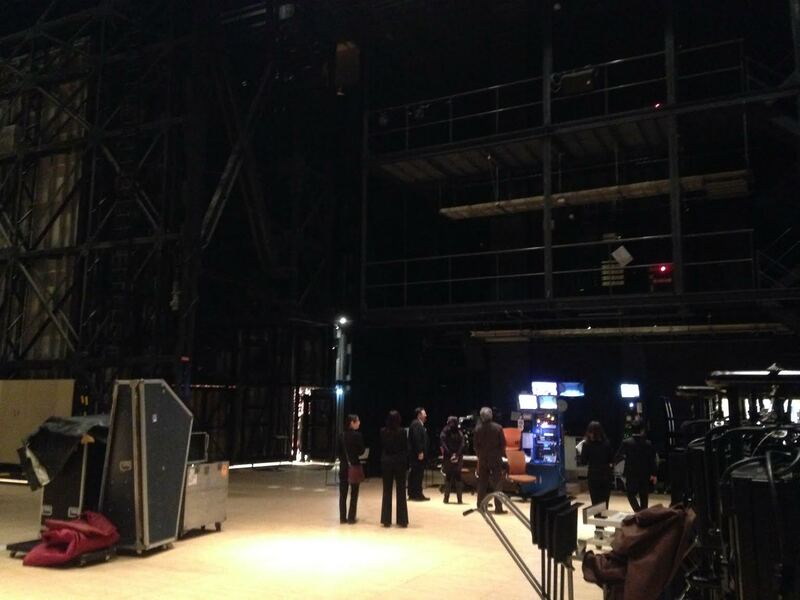 The back stage areas are enormous, the office spaces and dressing rooms are so numerous and spacious. It almost defies belief. 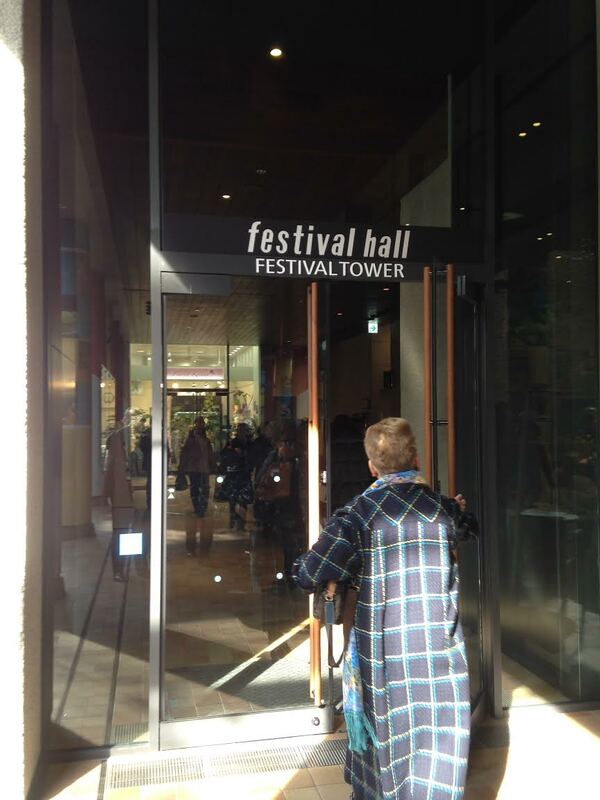 The only design flaw is a tiny backstage passenger lift so a whole symphony orchestra had to traipse up many flights of stairs! 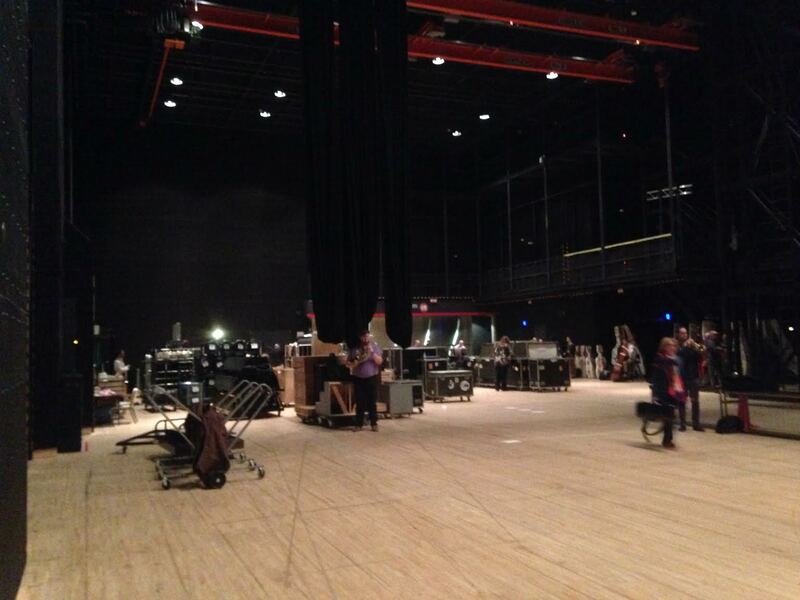 You can see from the pictures how much space is available back stage and the state of the art equipment etc. 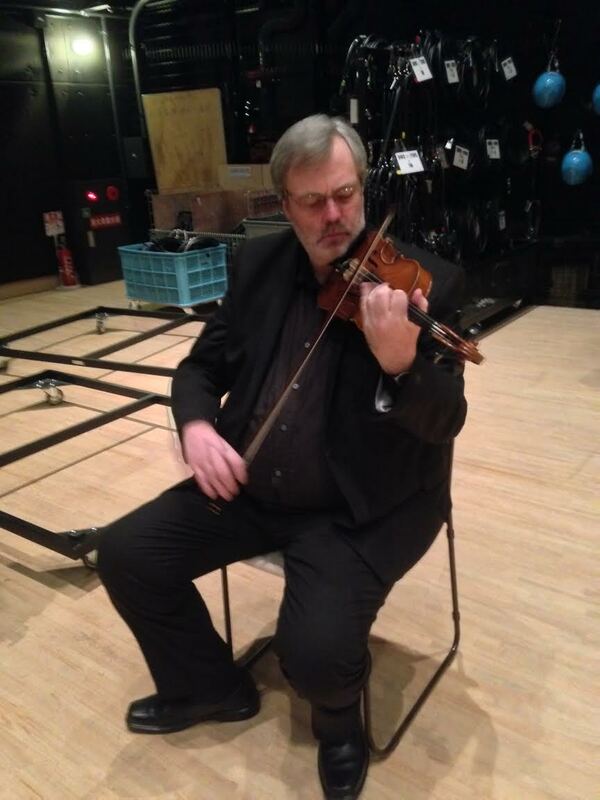 We arrived 30 minutes prior to rehearsal, to give players a chance to warm up. Always better, in my view, than arriving right at the last minute. 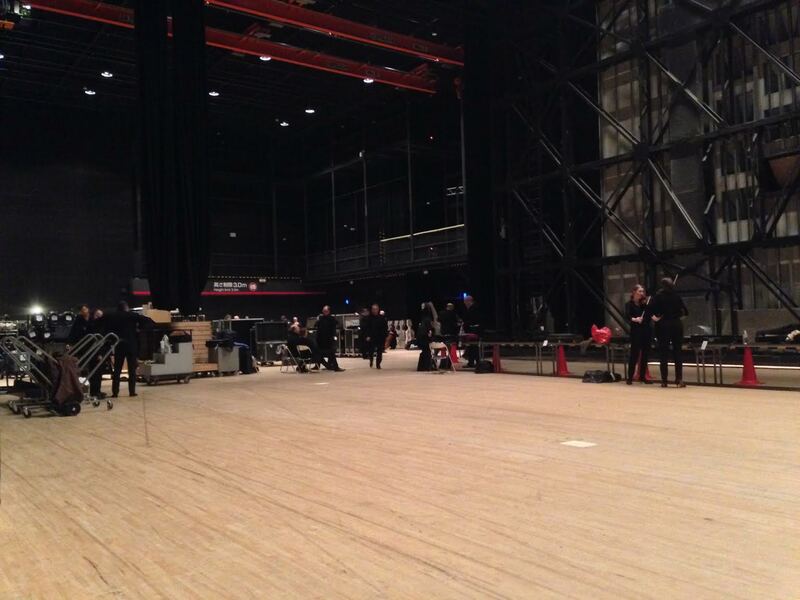 Like the backstage area, the performance platform was also on the grand side and the audience areas are also massive and very sumptuous. A lot of expense has been lavished on this modern facility. 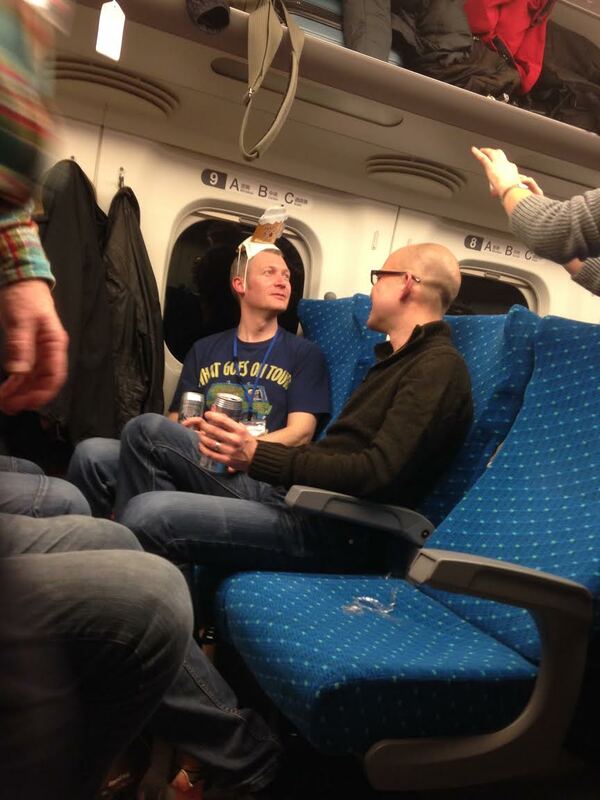 Money well spent. They have got this place right! The first item on the rehearsal order was the Prokofiev. Nobuyuki only needed to do a few tempo changes etc just to get the orchestra used to playing with him in this new acoustic. That left most of the remaining time for Vasily to tweak and hone The Rite of Spring and just the beginning of The Firebird at the end. 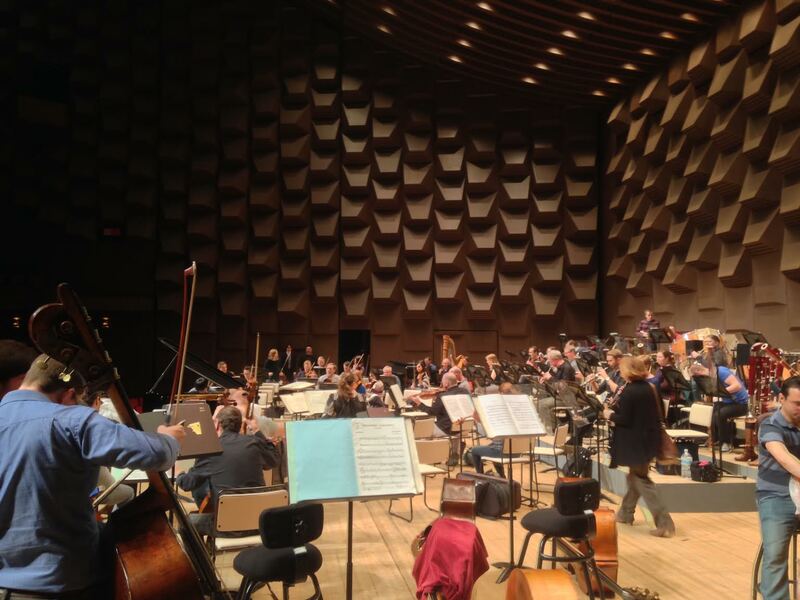 At the end of the rehearsal we had a special birthday surprise to give to Hiro-san, the Managing Director of the promotion company which brought the RLPO over to Japan. Hiro is himself a trumpeter and is a very big fan of the RLPO brass sound and style. So, as a special thank you for bringing us on tour and a birthday present, Principal Horn Timothy Jackson made a beautiful arrangement for the brass section to perform of a clever intertwining of the Japanese National Anthem and Happy Birthday. It was clear from his reaction that Hiro was delighted and very emotional indeed. This tour has been a special one for me on so many levels, but just as a tour, I think it is the best I have been on. The food, the service, the facilities, the hotels and the wonderful Japanese people have been a pleasure from start to now – there is a week to go yet! The acoustic on stage really suits the heavy brass pieces such as The Firebird and The Rite of Spring and I reckon the audience would be in for a thrill with this programme. Nobuyuko, pictured above is always first at the venues, practicing like crazy. For him it is definitely all or nothing. He is a really nice guy too. 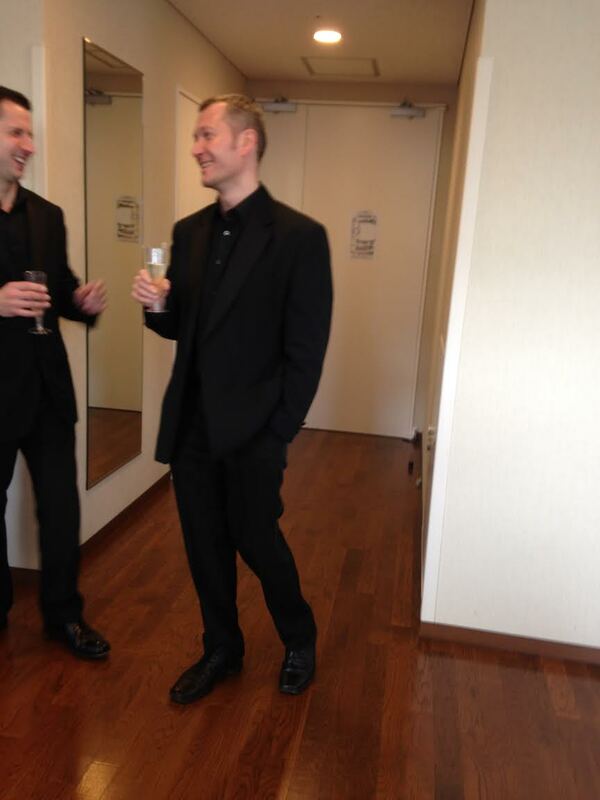 So is his business manager, Mr Nick Asano, who accompanies him everywhere. Nick came to join us at breakfast today and confessed that he is reading this blog everyday also! You may be wondering how Nobuyuki enters the stage. Vasily Petrenko leads him on by the arm and puts his hand on the piano. Vasily also leads him on and off for his ovations and encores etc. 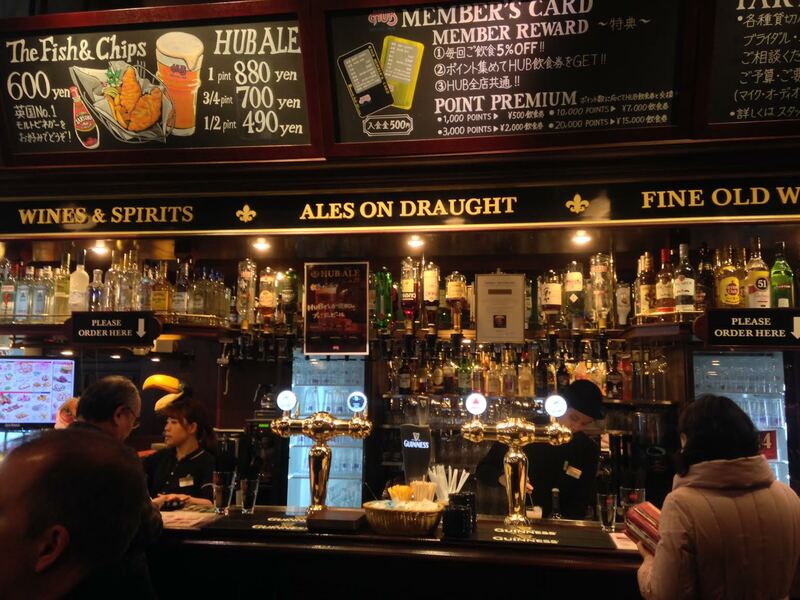 Imagine our surprise, at lunchtime, to happen upon a ‘British Pub’ at the front of the Festival Hall. 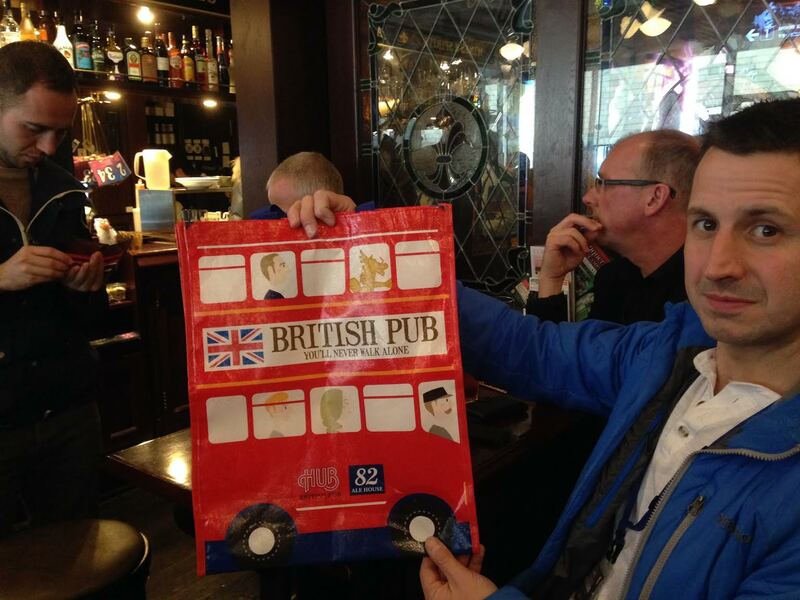 It presented a fine pint of bass and fish and chips for £3.00. Champion! If it wasn’t for the television screen playing pop videos this pub could have been a Wetherspoons house, just like in the UK. 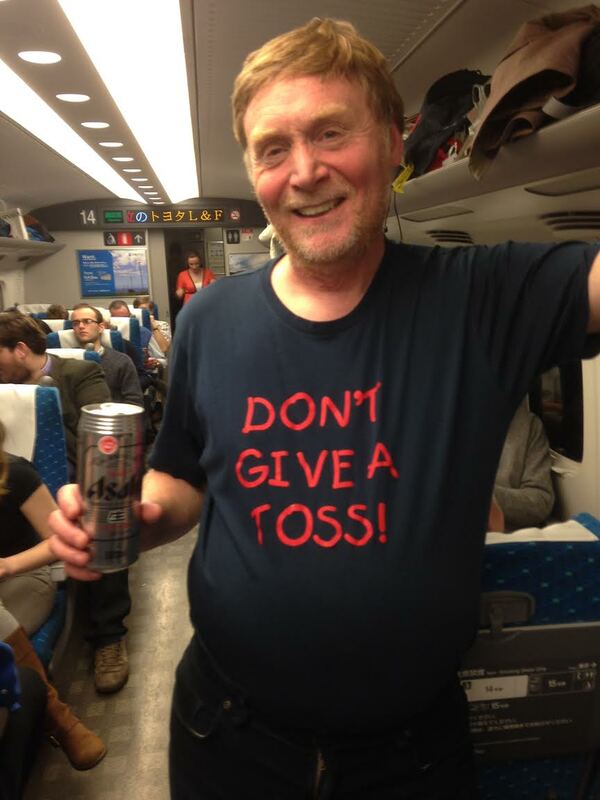 Of course, the Japanese have service off to a tee. An unfortunate waitress accidentally bumped me as she passed, spilling some of my beer. In no time at all she had cleaned up and topped up my pint. 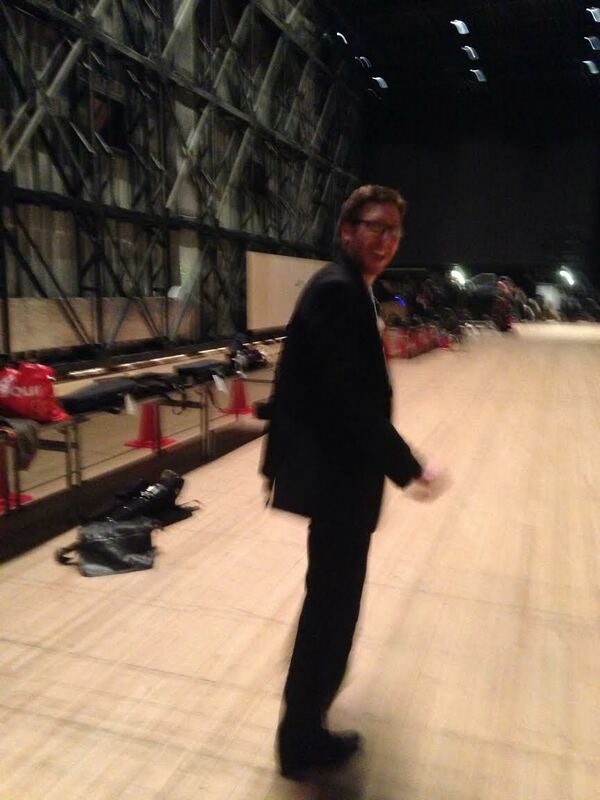 RLPO Principal Timanist Neil Hitt excitedly awaits his big chance! 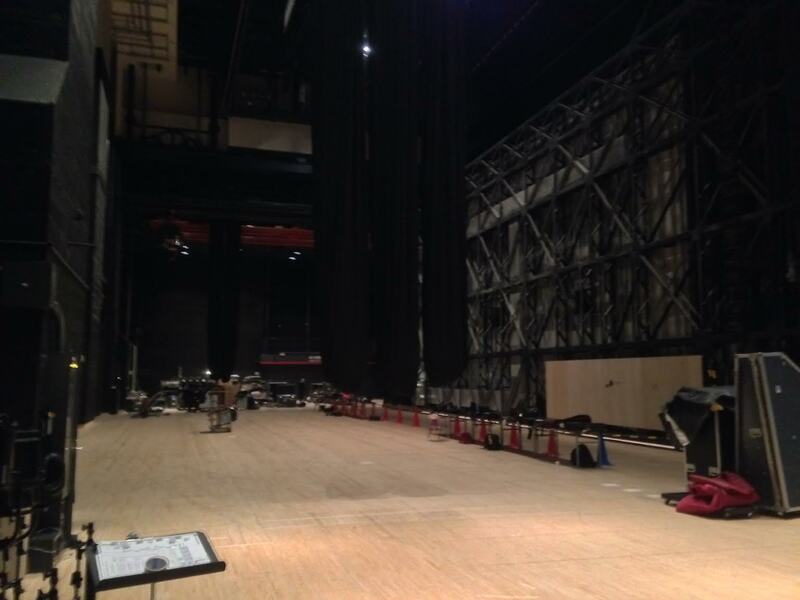 The Osaka Festival Hall has been sold for ages. This is despite the fact that the performance was an afternoon concert. There was certainly a buzz about the place as the 2,700 members of the audience eagerly awaited the proceedings to begin. The concert was another triumph. The audiences just love us over here. The extraordinary talent that is blind piano virtuoso Nobuyuki Tsujii gave an extraordinary performance of Prokofiev Piano Concerto no. 3. So much so that the audience once again demanded two encores from him. I have said before on these tour blogs that he is exceptional because he is a young blind man. If I wasn’t on stage in his presence it would defy belief that he could play all those piano concertos. It is not just that Nobuyuki-san is blind, that is remarkable. He is remarkable because he standard id right up there with the world’s best! 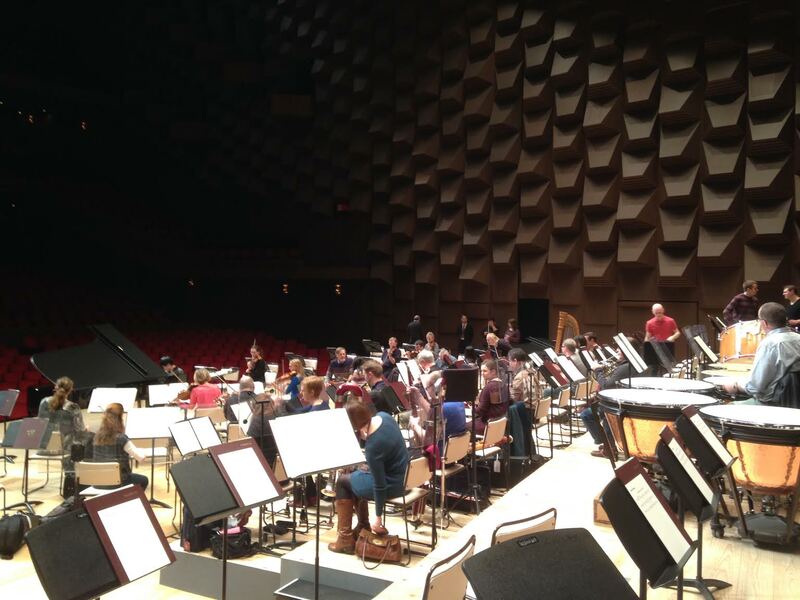 I am not in the Firebird on this tour and I was really proud of my colleagues as I listened to the RLPO performing it. As mentioned aerlier, this acoustic could really take The Rite of Spring and the orchestra brought out all of it’s barbarity, savagery taking no prisoners right up to the end. 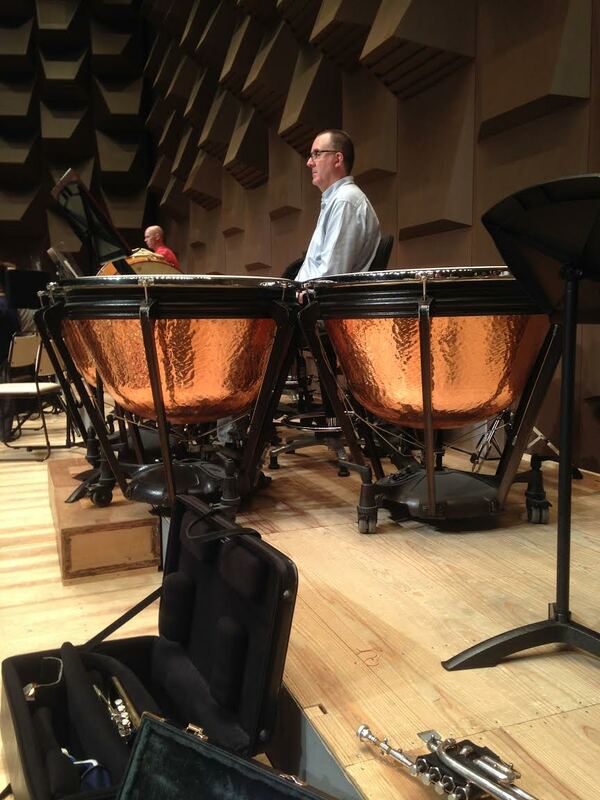 We only played one encore today, as the concerts have been lasting over two and three quarter hours. Almost as long as a Wagner opera! The Brahms Hungarian Dance no. 1 brought the house down. 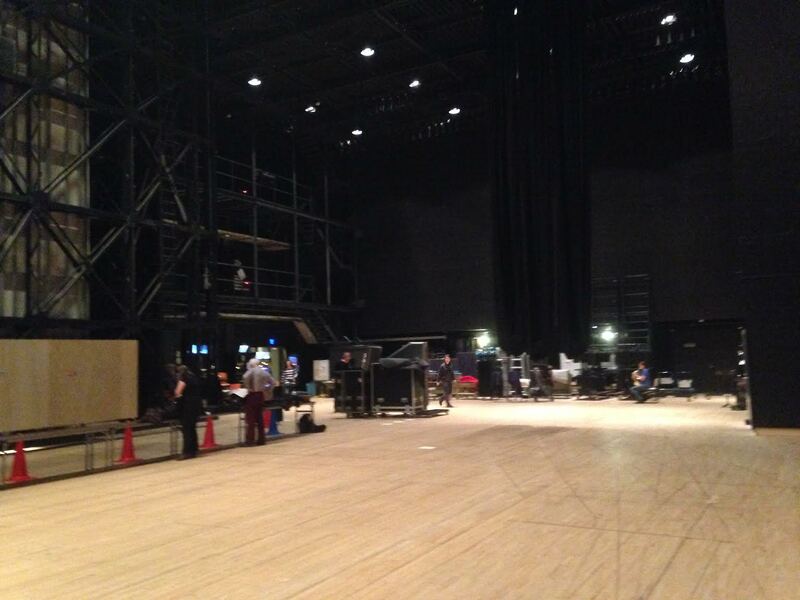 Goodbye Osaka Festival Hall. I shall miss this superb facility. It seems that in Asia, the RLPO have also visited China, they don’t skimp if something needs building. These facilities are amongst the finest in the world. All built as proud statements to impress well into the future.Afterwards, we went straight to the station and boarded the Bullet Train again. These occasions are always a lot of fun and give the orchestra a chance to let it’s hair down after the pressure of highly concentrated concerts. 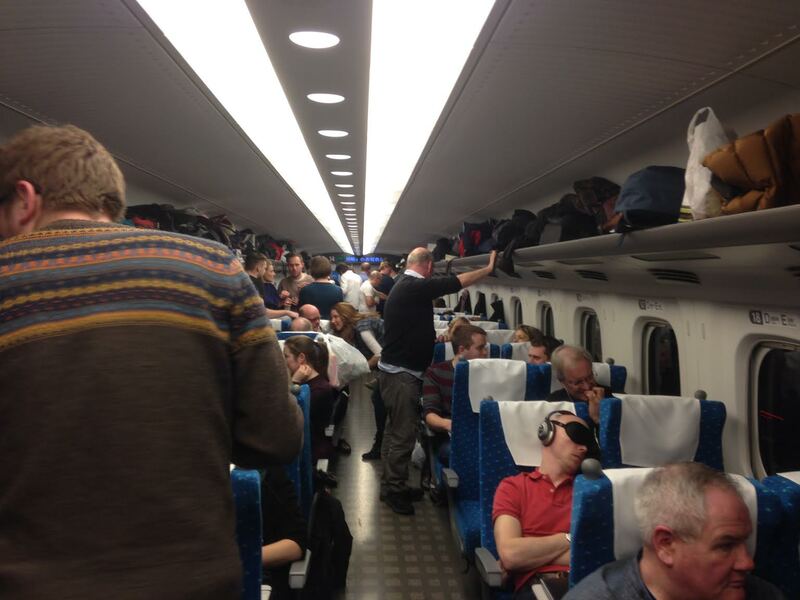 In complete contrast to our carriage the next one, which was exclusively Japanese was extremely well behaved! 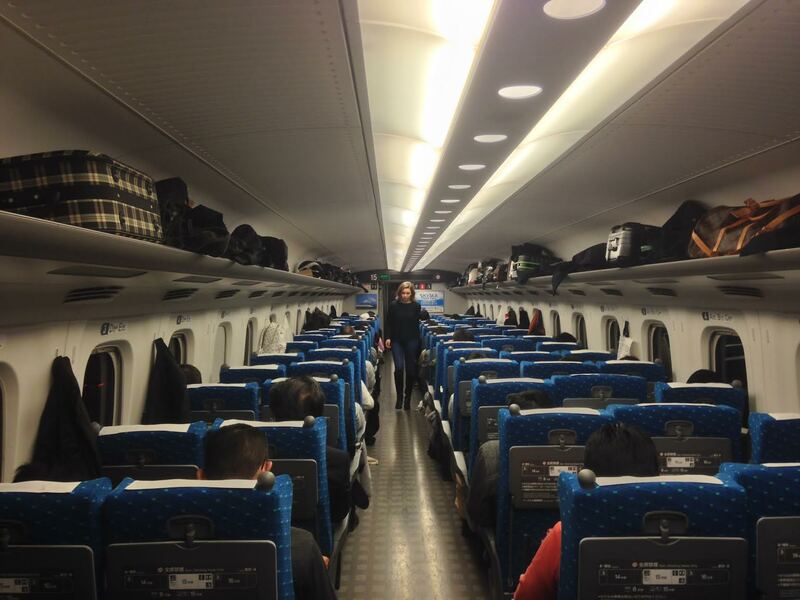 The young Japanese lady ticket inspector seemed highly amused! 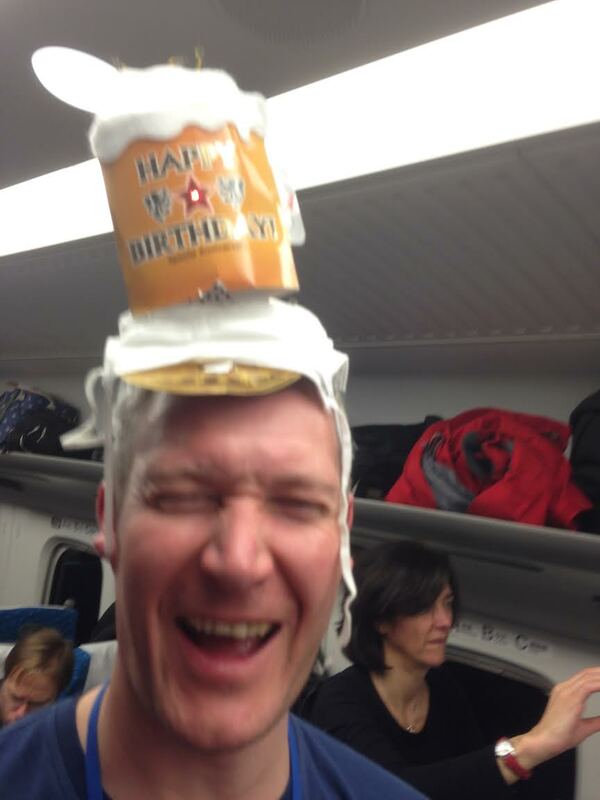 Happy birthday Simon – later! Sounds as if the band might want to stay – but we hope you are all coming back! Tokio, thanks for sharing that stunning video — my all-time favorite. Brendan: I just want you to know that many of us international fans of Nobuyuki Tsujii greatly appreciate your fun-filled blog posts. 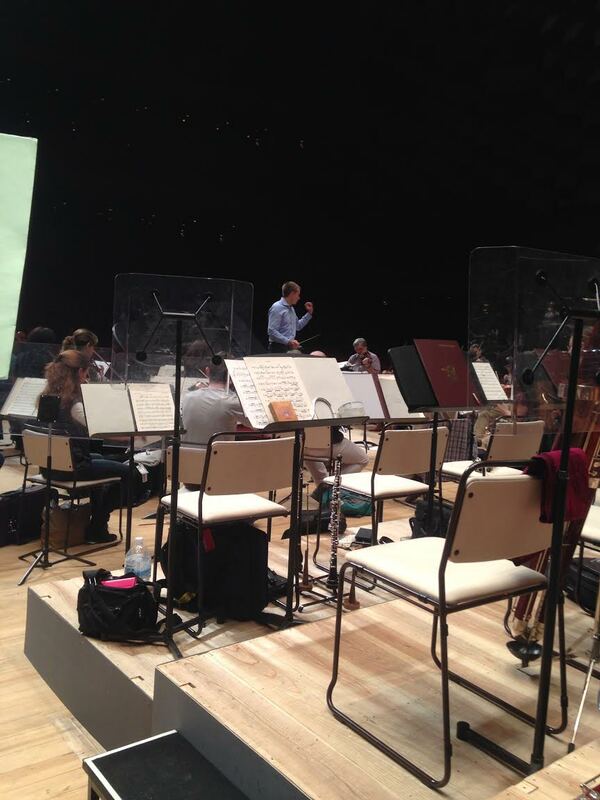 We are happy that the RLPO is having such a great time in Japan. Many thanks for the kind words for Tsujii-san. BTW the gentleman who escorts Nobu is NOT his father, but his business manager Mr. Nick Asano. Thanks for taking the trouble to make the correction, Ball-san. 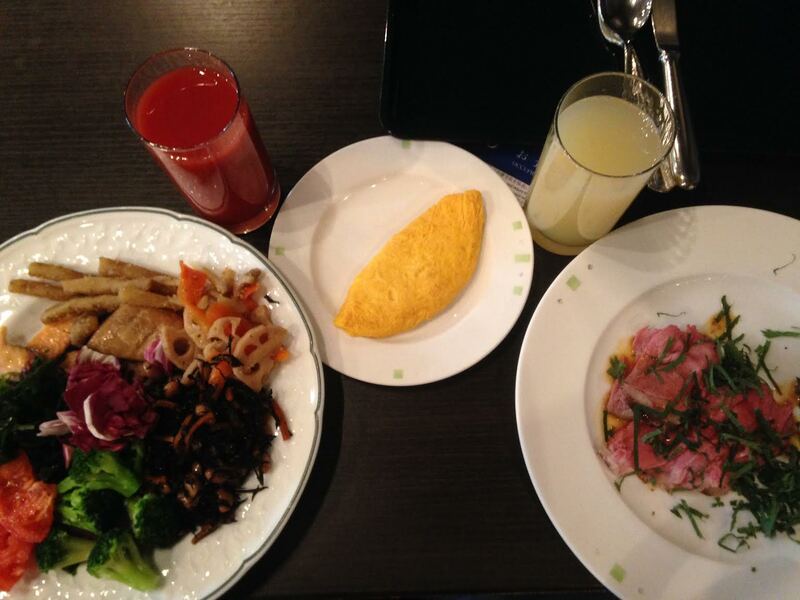 Nobu-kun’s father is a busy physician and, to my knowledge, he does not tour with Nobu. Mr. Asano is, as Nobu himself once put it, his “father while on tour.” I have met Mr. Asano in person and he is the nicest guy, as is Mr. Hiroyuki Nakashima, President of Nobu’s record label (Avex Classics International) and who personally held an iPad up to greet the RLPO at Narita Airport when the orchestra first arrived in Japan.